Genuine Lowepro Rolling Computrekker AW - this is a brilliant roller backpack for camera and photography kit. It has 2 zipper compartments - see photos 2 and 3 - the second of which has numerous pockets for lenses and camera bodies. The bag can be worn as a backpack or used as a wheeled trolley. It also has a waterproof cover, which is discretely hidden away at the bottom of the case. The item is marked as new, as it has never been used - see photo of wheels and underside of case. Collection in person preferred - but message me in advance if you would like a quote for a Hermes delivery. The potage cost shown above is indicative - actual cost will depend on delivery location. Used Lowepro Pro Roller x200 AW - excellent condition. Great spacious bag that even goes as hand luggage. Well taken care of with normal wear-and-tear. Mid-to-large size Pro roller from Lowepro.New and unused with labels. Lowepro designed oversized zippers with high-density pulls connect to an official TSA LOCK with a 3-digit combination. Dual-button trolley handle and comfortable grab handles with leather backing add extra convenience when transporting gear from point A to point B.
Lowepro designed oversized zippers with high-density pulls connect to an official TSA LOCK with a 3-digit combination. to accommodate a longer lens in the middle of bag. Dual-button trolley handle and comfortable grab handles with leather backing add extra convenience when transporting gear from point A to point B.
Lowepro Pro Roller x100 AW features Lowepro Pro Roller x100 AW specification To transport the Pro Roller with the hard-shell exterior, there is a dual-button trolley handle, with a sleek zippered cover, and durable, smooth-gliding wheels. Built-in all weather AW cover protects the entire Pro Roller from rain and dust. Built-In All-Weather AW Cover. MaxFit divider system has thinner, yet stronger touch-fastened dividers, which can be inserted after you settle your gear to maximize the interior space. Built-in all weather AW cover protects the entire Pro Roller from rain and dust. Built-In All-Weather AW Cover. To transport the Pro Roller with the hard-shell exterior, there is a dual-button trolley handle, with a sleek zippered cover, and durable, smooth-gliding wheels. Lowepro Pro Roller x300 AW. Built-in all weather AW cover protects the entire Pro Roller from rain and dust. Built-In All-Weather AW Cover. To transport the Pro Roller with the hard-shell exterior, there is a dual-button trolley handle, with a sleek zippered cover, and durable, smooth-gliding wheels. Lowepro takes its award-winning roller to the next level with the Pro Roller x-Series AW with MaxFit System. Now you can maximise the gear you can fit and protect as you travel. The patent-pending MaxFit System is easy to customise and maximises interior space. The HighLine Series from Lowepro. Deploy the patented, built-in All Weather AW CoverTM for extra weather protection. 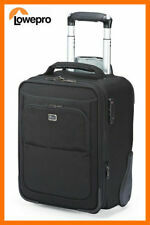 Cabin luggage approved for Easyjet and British Airways (not exceeding 56x45x25 cm). Sturdy two section pull handle. We will do our best to turn any less than satisfactory experience into a positive one. Inner removes and doubles as shoulder bag. Lowepro have taken roller to the next level with the Pro Roller x-Series AW. Its patent-pending MaxFit System makes it easy to customise and maximise the amount of pro-sized gear you can fit and travel with. MaxFit System interior dividers maximise carrying capacity. MaxFit System interior dividers maximise carrying capacity. Vibration-absorbing, wheels with ABEC-5 rated bearings. We will do our best to turn any less than satisfactory experience into a positive one. MaxFit System interior dividers maximise carrying capacity. We Always Provide The BEST SERVICE! The Lowepro Pro Roller Attache X50 Caseis a two-bags-in-one design that provides a rolling case combined with a removable Reserve Shoulder Bag. It can also hold a laptop computer with a screen up to 14" in either bag. You are buying a Lowepro Pro Roller x100 AW Rolling Bag, for Pro DSLRs, Lenses, DJI Mavic LP36697. Item will show minor signs of storage/handling Scuffs and Scratches SEE PICS. Still fully functional with a full life of use left. Built-In All-Weather AW Cove. Top & Side Leather Grab Handles. Impact-Protective Hard-Shell Exterior. Die Pro Roller x AW Serie bietet maximale Flexibilität bei der Organisation der Fotoausrüstung und optimalen Schutz für unterwegs. Die robuste Außenschale schützt zuverlässig vor Stößen. Das integrierte All Weather AW Cover schützt die Ausrüstung vor Wetterbedingungen. PHOTO-SPECIFIC LUGGAGE. The Lowepro PhotoStream Roller 150 is the perfect travel bag for everyone from photography enthusiasts and professionals in the field. KEY FEATURES. Easily reach your laptop, without opening your entire bag using the hinged front panel for security checks and last minute edits during layovers. THIS IS A GENUINE ITEM MANUFACTURED BY LOWEPRO . Lowepro Pro Roller x200 AW. Lowepro X200 AW Specs. Built-In All-Weather AW Cover. Built-in all weather AW cover protects the entire Pro Roller from rain and dust. Built-in all weather AW cover protects the entire Pro Roller from rain and dust. To transport the Pro Roller with the hard-shell exterior, there is a dual-button trolley handle, with a sleek zippered cover, and durable, smooth-gliding wheels. Wheel your gear around in style in the lightweight, durable black PhotoStream RL 150 Roller from Lowepro. Lowepro PhotoStream RL 150 Roller (Black). THIS IS A GENUINE ITEM MANUFACTURED BY LOWEPRO . Transport an impressive quantity of photo gear in style and comfort with the black Echelon Roller from Lowepro. It will accommodate up to a 300mm lens. On the front of the Echelon is a zippered pocket for storing up to a 15" laptop. THIS IS A GENUINE ITEM MANUFACTURED BY LOWEPRO . Lowepro Pro Roller x300 AW. Lowepro X300 AW Specs. Built-In All-Weather AW Cover. Built-in all weather AW cover protects the entire Pro Roller from rain and dust.